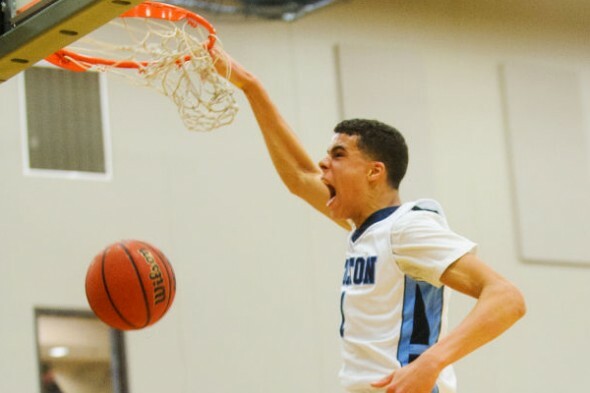 Huskies score with premier recruit Porter Jr.
Michael Porter Jr., godson of Lorenzo Romar and son of Romar’s new assistant, Michael Porter Sr., said he is committing to the University of Washington. He’s ranked No. 4 in ESPN’s top 100 for 2017. The long reach of coach Lorenzo Romar pulled in perhaps the most highly regarded player in his tenure at the University of Washington. Michael Porter Jr., the No. 4 player in ESPN’s top-100 class of 2017, committed orally to the Huskies, where his father, Michael Sr., was recently hired as an assistant coach. Romar, who was a teammate with Porter Sr. on the Athletes in Action team in the 1990s, is Porter Jr.’s godfather. A younger brother, Jontay, also committed to UW and is expected to play as a sophomore at Seattle’s Nathan Hale High School this fall, as will Michael. Porter Sr. was on the women’s coaching staff at Missouri and had offers from top Division I men’s staffs before deciding to join Romar. At No. 4 in ESPN’s top 100, he is Romar’s highest ranked recruit since the ranking debuted in 2007. Porter is the 14th player in the ranking to come to Montlake, third in the Pac-12 behind UCLA and Arizona. At No. 45 is another UW commit, Jaylen Nowell, a 6-5 shooting guard from Seattle’s Garfield High. The Huskies had two players drafted in the NBA’s first round — Marquese Chriss, taken eighth overall by Phoenix, and Dejounte Murray, 29th by San Antonio. Freshman guard Markelle Fultz is forecasted to be a lottery pick after his freshman year. Hoping that Charles O’Bannon Jr accepts UW’s offer. He’ll make a great recruiting class even better. Even better, hope that we grab Porter’s PG buddy or Daejon Davis. Great! Another top-flight recruit who will lead us to another mediocre Husky season and promptly leave for the NBA after his freshman year. So it’s out in the open now. He is at the U for 1 year. Actually 6-8 months. While the upfront honesty is noted–again, this situation calls into question the purpose of an institution of higher learning.